MY GROWING PASSION: Persoonia pinifolia seed propagation... I hope! Persoonia pinifolia is a notoriously difficult species to propagate by seed. So I've set myself the challenge! 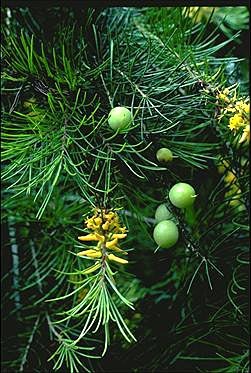 Also known as the Pine-leaved Geebung, this species of shrub is indigenous to a small region of Australia, between Broken Bay to the Royal National Park and the lower Blue Mountains. The difficulty in germinating appears to be caused by the hard, dense endocarp surrounding the seed embryo. 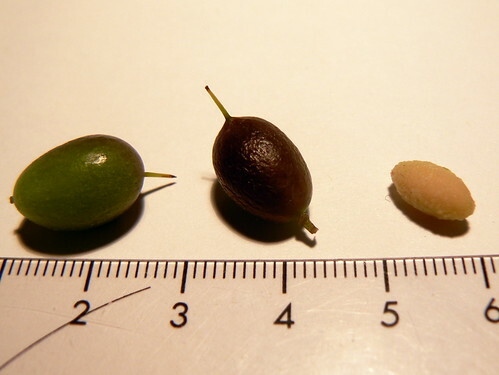 On the right is a seed with the flesh of the drupe--the seed's exocarp--removed. What you can see is the endocarp, and inside that is the embryo. Many species of seed need to have their endocarp breached in some way to allow the influx of water and oxygen so the embryo can germinate. There are many ways of doing this, depending on species and their evolution. Sometimes, the seed is placed in boiling water, as with Acacia seeds. Another methods include abrading or piercing the endocarp, or burning the seed. Seed dormancy can also be overcome by stratification (chilling) in the case of seeds from alpine and semi-alpine habitats, or by the application of water through which smoke has been bubbled. Just about everything has been attempted on Persoonia seeds by various horticulturists and plant scientists, without much success. One paper, "Propagation of Persoonia virgarta for the development of a new floricultural export crop," by Lynda Maree Bauer (ne Ketelhohn) and Margaret Johnston of the University of Queensland, suggests that one of the major factors inhibiting germination is the sheer hardness of the endocarp. Merely abrading or piecing it is insufficient, suggesting that there is in part a simple mechanical barrier to seed growth. So taking their research as my guide, I am going to try to break down the endocarps. Having removed the exocarps, I'm now soaking the seeds in water in an attempt to soften the endocarps by fermentation, and then will use pliers to remove them. The risk here, of course, is that I damage the embryos, and there is also a real possibility of contamination by bacteria or fungi. Thus it might all end up in a heap of failure, but it's worth a try. If I don't succeed, the next step will be to try propagating Persoonia pinifolia by cuttings. Apparently that's not always successful, but more efficacious than by seed. Watch this space! Obviously we have been reading the same information in regard to P.virgata. I have tried the fermentation method and exocarp removal with pliers. This is very hit and miss,I don't recommend it.I have also sown seed into mulch from underneath the P.pinifolia parent. It has been sitting for a year and so far no germination. I have a steam boiler and plan on steaming the seed with smoke injection via a venturi system. The theory; the seed coat will soften,allowing smoke to enter. This would simulate a bushfire followed by a thunderstorm and steady heat/warmth that would be provided by the summer sun. I have propped vegetively off and on for 20 years with a wide array of hormones,honey,coconut milk etc.Success has been minimal up to 5 cuttings rooted per 1000. Don't take tip out of cutting otherwise the cuttings quickly rot from the top down. Keep cuttings moist,not wet and avoid misting. I have had cuttings survive for up to a year adhering to the above,but most won't strike despite good health. I am passionate about Persoonia pinifolia(my all time favourite plant) and I am about to have another go,trying cuttings from various seed grown plants. I think the key is to find a genetic form that roots more readily than the norm. I am actually a nursery person by profession and P.pinifolia is my holy grail. I just have to crack it in my life time. Hello Margaret, I have been trying to find the key that triggers germination of my favourite Persoonias, P.Levis and P.Isophylla for nearly four years without much success. I believe the main barriers for this are the hard woody endocarp, a natural dormancy period for the embryo to develop, and contamination by bacteria and fungus. My findings may be helpful to you and others that are passionate for the Geebungs. Only fallen fruit can be used, as the embryo will not be formed if picked from the plant. The endocarp can be easily removed by squeezing the flesh, they are then rubbed between two sieves in water to remove most of the remaining flesh. Place them in a warm dry place for one year, this period allows the endocarp to develop two natural splitting lines for easy embryo removal. Also the testa will remain on the embryo, reducing the chances of contamination. In nature the smallest section falls away first allowing moisture into the embryo, and once germinated, the embryo breaks the larger section away with its growth. I use good quality toenail clippers to split the endocarps along these lines. I sterilize the moist sowing media in the microwave oven for two minutes or until steam rises from the lightly covered container. I water in the mornings with an atomised spray bottle, as overwatering will cause the embryo to rot and encourage fungus to grow. At present I am still experimenting and always hopeful for a breakthrough. Thank you, Don! I am impressed by your dedication and perseverance. Please keep us posted and let us know when you reach the holy grail! It will be my pleasure and beneficial to many people including Trees In Newcastle nursery where I volunteer. Just an aside, I have found a proven method for propogating Gahnia Aspera, getting 95% germination in 14 days. This was a delight for the staff at the nursery. I haven't seen any for a while, and they were in a National Park, where you can't collect seed without a licence. If you have a licence, email me at monocotyledon at gmail dot com, and I'll let you know the locality, as best as I can recollect it. Alternatively, you could try the Australian Plants Society, which has a seed bank for members. No Margaret i'm not licenced so I will follow it up with the APS of NSW. Perhaps David Theobald might be able to help me if we can make contact with each other. Don, given that you're volunteering with your local council nursery, maybe talk to them about securing a collecting licence? Might work! I live in the Blue Mountains and i know where several of these plants are (including my backyard)they are in flower at the moment! I was hoping to have a go at propagting myself but it sounds a little above me level. When is it best to harvest the seeds? A bit of a way off thought but could it be one of those seeds that an animal / bird has to eat then pass for it to successfully germinate? I found you through googlle search looking for help with germinating Gahnia aspera. We're using it in suite of native grasses for a revegetation project in Brisbane and have collected seed from the local area. Don's post caught my eye and I'd like to find out more. Hi Treeman, if you want to contact me for information please use my above email address, I'm more than happy to pass the method on to you. Treeman has made contact with me re the GA's and if Darian would contact me the same way, I'd really appreciate it. Hi Margaret, Treeman has made contact with me, and I would appreciate if Darian contacted me the same way. Have you made contact with Darian and if not, how many seeds are you interested in collecting as I have a persoonia pinifolia in my front yard which has about thirty seeds on it at the moment? I'm unsure if you have made contact with Darian and if you are still wanting persoonia pinifolia seeds but I have one tree in my yard that has over 30 seeds on it at the moment and you would be welcome to those if that is quantity enough to be useful. No I have not made contact with Darian as yet. Yes I would like to obtain some seeds from you if it is at all possible. Would you mind contacting me on my email address....roxxe1@bigpond .com to arrange this. I recently have picked up a kilo of Persoonia Levis seeds in Emu dung. I was reading how this species has mycorrhizal fungal associations. I was going to dig a little of the soil where these were growing to put in the seed raisin=g mix. I think these seeds having gone through the digestive system of the emu should be ready to go? Sorry about the thread hijack, but Don a real germination method for Gahnia Aspera, is basically groundbreaking for the nursery industry in Brisbane. We have been trying to get them germinating for years. I have contacted you via email, keep up the good work. Not a thread hijack at all, Darcy! I am glad this thread is providing an opportunity for discussion of this conundrum.